We've all heard of the ever popular fidget spinners, right? They have been the talk of the internet for months. Pretty much everyone that I know has bought one or more for their children. Some of my friends have bought one for themselves. 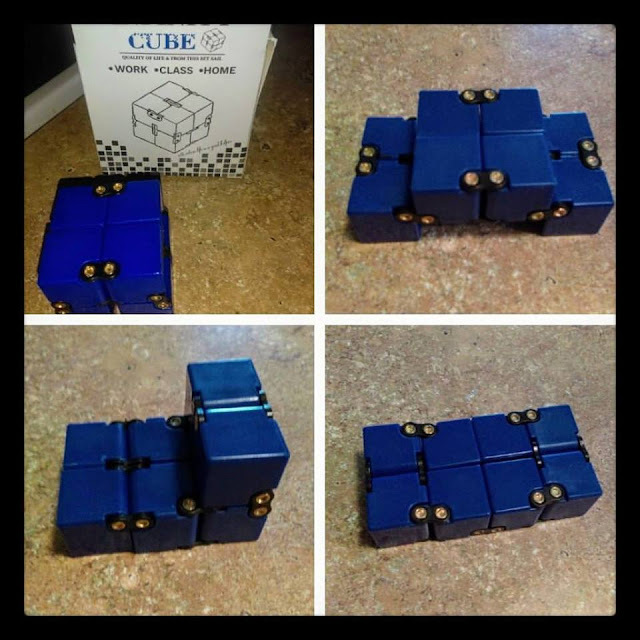 Well , let me introduce you to the #infinityCube. It is also known as a fidget cube. These are supposed to be great for relieving stress, anxiety, and to help you focus better. They just might work well for people ADHD as well. My nine year old son sometimes likes to play with his fidget cube while he's doing his homeschool work. He says that he likes it because it can do so much more than his fidget spinners. It can be transformed into different positions. It seems to help him stay in his seat more since he is doing something other than just sitting still. Since it's actually keeping him calm and busy, I like it. It just has a pretty cool look to it too. It would be nice even just sitting on a shelf or desk at the office. This really cool product can be purchased on Amazon.